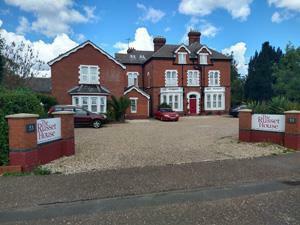 The Russet House01553 773098work Guest HouseA substantial late-Victorian property close to King’s Lynn town centre and railway station (10 mins). A substantial late-Victorian property close to King’s Lynn town centre and railway station (10 mins). Two guest lounges and licensed bar. Prices include a freshly cooked breakfast. Evening meals are available for groups. Free WiFi and ample off street parking. All rooms are en-suite and have tea/coffee making facilities. Child cots available.